God is ever with His Church. 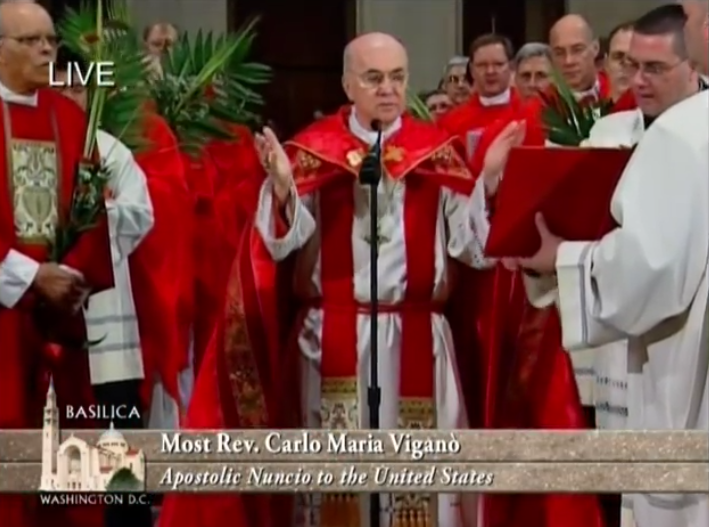 Just as God raised up St. Peter Damian, so He has raised up Archbishop Carl Maria Vigano. Yesterday evening, Archbishop Carlo Maria Vigano, the former Papal Nuncio to the United States, published an 11 page "Testimony", exposing and denouncing the decadent, corrupt web of evil, led by homosexual, or pro-homosexual churchmen: Parolin, Sodano, Bertone, McCarrick, Wuerl, Cupich, Farrell, Maradiaga, Baldissiri, Cocopalmerio, Paglia... the list goes on and on...and up to the Pope. Yes, Pope Francis, has committed "evil", has covered up for McCarrick, and he too must "resign", wrote the former Nuncio. The homosexuals, states the Archbishop have the Church "in a stranglehold". Pray, dear friends, that Cardinal after Cardinal, bishop after bishop, priest after priest, will join in demanding the Pope resign for the good of the Church. to be credible witnesses of the immeasurable love of Christ, the Way, the Truth and the Life. silence have not prevented that such crimes continue to be perpetrated. 2011 until end of May 2016. Secretary of State or by the Substitute of the Secretariat of State. a bed with the Archbishop. for a prompt intervention by the Holy See. depraved acts, sacrilegious celebration of the Eucharist with the same priests after committing such acts. faithful, who despite everything continued to love and believe in the Church. authority and continuing to destroy innocent victims. decision by the superiors on this matter. later, on May 24, 2008.
sanctions established by the Code of Canon Law, which also provide for reduction to the lay state. lack of any communication with me since my first memo in December 2006.
with the obligation of dedicating himself to a life of prayer and penance. accustomed to managing the information he thought appropriate to convey to the Pope. therefore my duty to reveal what I know about this, beginning with the Roman Curia. and in his place appointed Sandri, then-Nuncio to Venezuela, who was willing to collaborate in the coverup. affirmed, that is, that Pope Benedict had decided that the Maciel case should be considered closed. valid. Ça va sans dire that my letter never received any reply! imposed by Pope Benedict on McCarrick. State, knew in every detail the situation regarding Cardinal McCarrick. Bishops of the Catholic Church on the Pastoral Care of Homosexual Persons. Cardinals EdwinFrederick O’Brien and Renato Raffaele Martino also belong to the same current, albeit with a different ideology. Others belonging to this current even reside at the Domus Sanctae Marthae. now completely compromised by the recent revelations regarding his behavior as Bishop of Pittsburgh. McCarrick and the measures taken by Pope Benedict, how can his answer be explained? upon his Chancellor, Monsignor Antonicelli, to lie as well. by the academic authorities of Georgetown University, I brought it to the attention of its President, Dr.
Georgetown had taken place for seven years. But the Cardinal knew nothing about it! seminary in Washington D.C. In doing so, he put other seminarians at risk. responsibility as a member of the Legionaries of Christ? are disconcerting, and have totally obscured his transparency and credibility. them under oath by calling on God as my witness. elected only three months prior, after the resignation of Pope Benedict. clarify as soon as possible what the Pope intended to tell me. left-wing and being homosexual escaped me, but I added nothing else. I was an ally of McCarrick or not. between the two of them about the admission to Communion of pro-abortion politicians. Pope Benedict, for important posts such as Philadelphia, Baltimore, Denver and San Francisco. again the Pope did not show any reaction. with Wuerl and immediately appointed Cupich right after he was made a cardinal. department to Archbishop Secretary. Something unprecedented for such an important position! young adults by homosexuals who were in a relationship of authority over their victims. Sipe on July 28, 2016.
closely associated as it was with the deviated wing of the Jesuits. McCarrick, who abused his authority with seminarians and priests. trusted counselor along with Maradiaga. tried to commit suicide over homosexual abuse in the seminary. Honduras Alejandro Valladares, former Dean of the Diplomatic Corps to the Holy See. simply been accepted, thus making any possible responsibility of his and Maradiaga vanish into nowhere. Alcides Casaretto, delivered more than a year ago only and directly to the Pope, must be made public. save his image in the media. ambitions and power in the Church, should resign. and strangle innocent victims and priestly vocations, and are strangling the entire Church. Let us heed the most powerful message that St. John Paul II left us as an inheritance: Do not be afraid! she is made up of men stained with sin. is guilty for the good he could have done and did not do ... If we do not oppose evil, we tacitly feed it. that the great majority of our pastors live their priestly vocation with fidelity and dedication.